On we go with our reading of this classic tale of heroic envy, hate and betrayal and epic revenge. I'll quote from a verse translation (this one) and tell it from a gamer's perspective. If that's your cup of tea and you haven't seen Part 1 yet, feel free to use this link and start there. Part 3 can be found here. Although the verse translation has it's own charm, I highly recommend reading a prose translation of this epic. We've learned to read things for their story nowadays, not so much for the art of the verse and The Song of the Nibelungs is a story very well worth reading. A free online prose version of the text can be found here. Have fun! Where were we? Ah, Siegfried had been introduced as high-level adventurer, a dragon slayer and conqueror of the Land of the Nibelungs. He is invulnerable, has a magic sword that cuts through anything (I'm actually not sure if he could cut himself with it ...) and a Cape of Invisibility that also gives him the strength of 10 giants. Not a guy you'd want to mess with, but right now he's out for the booty: the fair princess Kriemhild of Worms has vowed to never fall in love and that's the kind of invitation that makes our hero fall in love with her without even seeing what he's gambling for. Of knights unknown who harbored / against him secret hate. When there was heard the story, / at heart in sooth the grief was great. "Since but the fated dieth, / so let all such lie dead. Whoe'er hath hate against us / shall ever here right welcome be." Beautiful, isn't it? "Since but the fated dieth, / so let all such lie dead." Very death defying, very much what you'd want a knight to be like. And yet they know it's very short notice to muster an army and march against the Saxons before they arrive at their doorstep. All agree to ask Siegfried for help. So that all our castles / peace undisturbed shall have." Then bade the king to summon / his friends with all their warriors brave. Toward the land of Saxons, / where battle was anon. So that both the monarchs / full well the woes of war did taste. Yes! Murderhobo-action! As soon as they are in the enemies land, they start to loot what they could carry and burn the rest. They even send back the baggage train as an incentive for the army to take what they want from the land. The ice cold logic behind this is to make those kings feel the pain of kicking this particular hornet's nest. Full forty thousand were they / or more good men of might. The hero high in spirit / saw right joyfully the sight. The fiery sparks all crackling / beneath his hand around. Each warrior in the other / a foeman worth his mettle found. Beneath his arm of valor / the thirty soon lay dead. In sooth the blood-red helmet / spake all the hapless tidings true. And I unto the army / of Luedeger will lead. Helms many hewn asunder / by hand of good knights there shall be." And how eager they all are to charge an army 40 times stronger than theirs even though their hostage would most likely guaranty the end of all hostilities. No Sir, they're in for the carnage - and that's what they get. You'll read in those verses about heroes getting cut down by even mightier heroes, rivers of blood and shattered shields. Siegfried and his buddies are always where the battle is thickest, even the Burgundians can't keep up with him. This is one happy slaughterfest and Siegfried is an artist among dilettantes. "Give o'er from fighting further, / good warriors every one! Of netherland the doughty / knight on victory bent. Him has the evil Devil / to scourge the Saxons hither sent." I imagine him saying it with as much gusto as could be expected from a guy in dire need of a new pair of underwear. So they make peace and the Burgundians take 500 hostages and two kings back to Worms. It must have been a very impressive battle. Worms, on the one side, lost merely 60 men (no knights among them, btw), but the losses of that other army went into the thousands. Most of it because of Siegfried, but there's a lot of name dropping in those paragraphs. Good show by all. And if thou tell'st not falsely, / good friend thou'lt ever find in me. And weep aloud must women / for friends by his strong arm laid low. And to thee shall be given / ten marks of gold as well." 'Tis thus a thing right pleasant / to ladies high such news to tell. And many a shattered helmet / into King Gunther's hand. And a right hearty welcome / from friends rejoicing had they all. Nice touch there, showing off the shattered helmets and shields to the king. Then the prisoners are brought before him. All are quite polite about the whole affair and make their peace right quick. The kings of Denmark and Saxon will have to pay a hefty ransom to get out of there again. And of course they have to vow that they won't do it again. Than they and all their followers / merrier men there none might be. For making whole the heroes / after the battle sore. To all his friends the monarch / gave presents rich in goodly store. They just don't stop spending and the next thing you know is that the king seeks council how to reward his knights. A f*cking huge party, that's how. He takes 60 days (!) to prepare for the feast and all the knights get some time off to go home to their families. The ladies, of course, get wind of the party and start producing fancy skirts immediately. And thus ends the fourth adventure. Siegfried and Kriemhild have yet to meet each other and the party is where it will happen. But that will be part of another post. This third part will conclude the set of rules I used for our initial play-testing. Everything after that will be exploring new territory (level advancement, adventuring and resting seasons, magic, random clan territory, there's still a lot to do ...). after reading Part 1 and Part 2 and what I'm writing right now you'll know what I know (well, mostly) about Lost Songs of the Nibelungs. It's not finished, but it's already a game and everyone interested in seeing what Lost Songs will work like should have a first impression by now (or in a couple of minutes). I know, I'm writing and re-writing this all over the place. I have been told. And yet, it's crucial in finding an understanding and I believe it's interesting to see how it all started and where it ended, no? And writing this on the blog helps me focusing, so there is that. Anyway, here is a complete summary of how Qualities work in Lost Songs, with some new ideas and what from the original concept actually worked at the table. Traditionally in role playing games you have a set of active stats (ability scores) and a set of passive stats (saves) to let characters interact with their surroundings. My understanding is that everything in rpgs derives from this basic concept: Skills and Combat are on the active side as things you use, while threshold of pain, spontaneous reactions to the environment or surviving poison, to name but a few, are on the passive side of a system. There is a clear distinction and if you are aware of it, you can shape it as you see fit and as long as you keep this basic distinction in mind, you can't do much wrong. Expanding more on that passive part is what I'm mostly doing in Lost Songs. There is a very close relation between Qualities and Saves as Saves are in the beginning circa 2/3 of a qualities value and when there's a permanent change of a Quality's value, it will also affect the save to some degree (but not base attack and defense). To make this a relevant gimmick in the game, Qualities are considered pools that will be reduced during session, which might result in permanent damage that, over time, will shape each character with individual scars and knacks. All this should interact with each other in ways that translate well from using the system to talking about the game (the narrative). When using Qualities as pools, it is important to find reasons for those pools to be used and in an ideal case it would result in a broad spectrum of uses that covers all challenges a group of adventurers could encounter and is detailed enough to allow some distinction between what just damages a character's quality and what leaves permanent marks. This just leads back to the basic concept described above: the importance of active and passive distinctions in a system and the subsystems it needs. More specific, characters have some sort of hit points (Health in LSotN), those are traditionally connected to some sort of Constitution (Grit, in this case) and it is not far fetched to allow damage to somehow affect Grit. So I came to see it the other way around. Health is just a necessary extension of Grit, since getting hurt is a very important part of the game. So damage reduces Health first and Grit after that. Permanent damage doesn't heal on a daily basis. Most of it doesn't heal at all, actually. But characters will have a chance regaining some of that between quests by celebrating, courting beautiful maidens and leveling up (to give but a few examples, the complete list will be part of a future post about level advancement and the seasons ...). Applied on all Qualities, permanent damage will over time map a character's history. But what's easily enough explained with damage, really needs some additional rules for all the other Qualities. The solution is quite easy, I believe. When a character fails a save (a roll of d20 + save value vs. difficulty), he looses the difference between what he rolled and the difficulty needed as damage to the corresponding Quality. Example: A character sees a tentacled monstrosity and his Sanity is challenged. DM wants to make it difficult, so he says it's a save vs. 25. Character has a Sanity value of 10 and rolls a measly 3 and comes up with a 13. The difference now to 25 is 12 and that's the damage he get's on Wits (because that's the corresponding Quality). If we go with the initial values described above, his Wits value would be 14 (with a 10 buffer and 4 "scars") and the character would definitely keep some mental scars from the experience. Taking the Grit-example above for healing rates, the character'd need 5 days to recover from that (3 days to heal the first 10 and two days to heal the other 2 in "scars"). 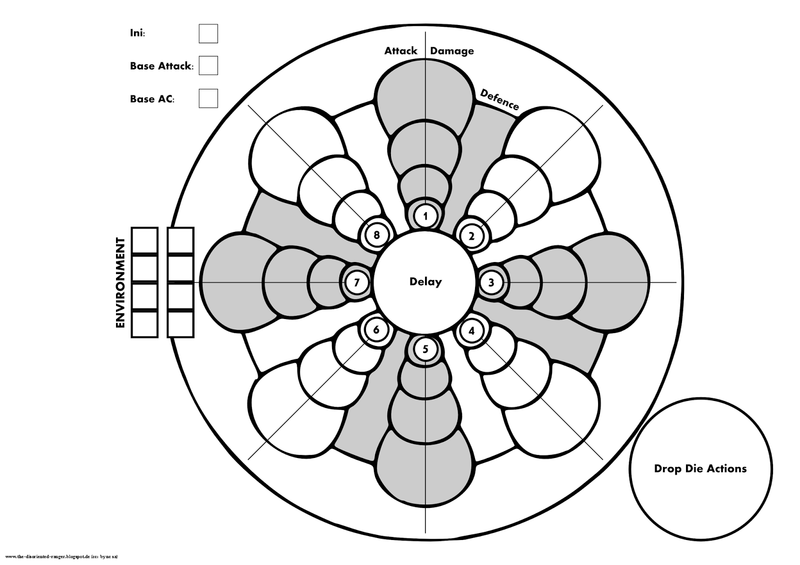 I believe this systems maps everything a character could experience in a game. It's also always connected to what happens during the game that goes beyond a system response (something like: "Jörge just never regained his speed again, after he'd been so humiliated in that race a year ago ..." or "Since he'd shot his nerves back in the Silkhorn Woods, he always got nervous sneaking through dark woods."). One last word about permanent damage, Saves and Fate. Permanent damage will reduce a Quality and the buffer/scar stages respectively, but the saves stay the same. Anyway, since all permanent damage is linked to certain events, it's easy to assign circumstantial deductions whenever possible (so if the character in the last example above has to enter some dark woods again, he'll get an appropriate reduction of his Serenity Save, if it becomes necessary to check on it). So far the system is a bit heavy on the passive interaction part of the game. How characters react to their surroundings is covered in detail now. As for the active part I'd say it's a rather traditional approach. If a character wants to do something and it's not related to a skill or combat, he rolls a d20 + the appropriate Quality versus a difficulty. If a character has a skill he may use for the task, that skill's bonus is also added to the roll. It doesn't end with failing the roll, though. A character will always have the chance to use Endurance to fill the gap. Example: Let's give an extreme example for all of that and make a character unhappy. After a fight a character is already in the buffer zone (5 Endurance and a buffer of 11 and 5 for "scars", lost already 14 points, so 2 are left in the buffer) when fleeing from some wolves and wants to climb a cliff to safety. It's a coordination task and a check on Finesse is needed (Finesse: 14). No skill applies and the difficulty is 25, because that cliff ain't that hard to climb. Player rolls a 2 and that really ain't enough. Since it would be worse to fail climbing that cliff and face those wolves again, player decides to burn some Endurance and forces himself to make it. So he needs to bridge the difference between what he rolled (16) and what he needed (25) by using Endurance (9 points) and that produces a new problem: it would result in permanent damage to Muscle (-2). Player won't have that either and reduces his Fate by two instead. He reaches the top of the cliff and is save from those wolves, but he's also laying there breathing hard for some time before he'll find the strength to move on (Endurance will recover fast after an encounter, something like Health value per 10 minutes) and might even pass out, since he dropped Muscle down to zero (Save of d20 + Withstand vs. 20 or he passes out). So the active part is kept quite simple and that's on purpose. The main work is for the DM to stem. He needs to know how the surroundings interact with the characters and needs the tools to do so, while the players just need to state what they want to do and an easy understanding how the system is used for it. Combat is a bit more complex, but that's okay since there'll be lots of fighting and I believe it needs a system complimenting that fact to make it worth the exercise. That's it. That's what I got and play tested up until now. I have a very good idea how combat will finally work (damage by weapon, ranged combat, sneak attacks and two weapon fighting are all done, but untested) and the next big projects are magic and level advancement before the gaming group gets back together. I also hope to get some random clans territory system and a creature encounter table done. But there are some other projects I need to get written in June and the Goblintribe-Simulator needs to make some steps, too. Part 1 is about character creation and can be found here and Part III about Qualities and Task Resolution can be found here. Let me start with the reasoning behind this. Most role playing games work under the assumption that players first state their intend and then roll some dice to see if it works or not and how. There's nothing wrong with this, but in combat (and I have seen this argument made more than once) it becomes tiresome to not make this one time and be done with it, but (often enough) for every attack a character makes. It can end up being a dull exercise. What I'm doing now in Lost Songs is very different in that the roll for a round is made at the beginning and not with a d20 but (for level zero characters) with 2 six sided dice (every 1 is discarded, every six with the first roll generates a new die to roll for the round). The sum of what a character comes up with is his initiative, the number of dice is the number of actions he'll be able to make that round (like attacking, defending, moving and so on) and the face value of those dice gives a hint how good he'll be at what he's doing. The slowest character/NPC/monster has to declare actions first so that all the faster characters can respond to that, since they see it coming. Teamwork in this system is now not only doing something so another characters doesn't have to, but an action where one player gives a die to another, effectively raising that player's dice pool. That's the main idea, I'll go into detail later on. The effect of this approach, though, is very interesting to watch in my opinion and worth pointing out. Since everything a character does is now connected to the dice he has available that round, players are way more engaged in what's happening at the table. If you're slow it's wise to see what could come your direction (since you see what the DM has rolled and see his potential for attack and so on) and prepare for that, if your fast, you'll want to see what the others do to have the optimal response to that. They start discussing tactics and strategy immediately and from that emerges a narrative of the combat. It becomes an intense experience where good and bad rolls still are important, but the decisions the players make because of what they got really drive the combat. Another basic concept is to make this work with D&D or, more specifically, the D&D Rules Cyclopedia, since that's the edition I'm hacking here. I'll talk more about this at the end, but let me say right now that conversion is nothing more than adding or subtracting a few numbers and not more work than a DM would usually have using the RC. Let's begin with what the players are working with in any given round (details follow below). The main actions a character can do are attacking, defending and doing (or avoiding) damage. Every other action he does that round is called a Drop Die Action. So far 5 Drop Die Actions turned out to be the most useful: moving, regaining Endurance back, binding an enemy, co-operate with another player and countering drop die actions of the opposition. Furthermore it is possible to carry up to two dice for main actions into the next round. It's like taking aim, preparing a strong defense or really putting some juice behind some damage. Every round a player has to decide for a couple of those actions and is limited to the number of dice he has available. How many he has depends on what he rolled, what other players gave him and what he might have carried to this round from the round before. At the end of a round actions are resolved from the fastest initiative down to the slowest, starting with counter drop die actions, resolving the remaining drop die actions and ending with the main actions. Main actions all happen at the same time, so a combatant getting killed in a round might still be able to land a hit before he goes down. Combat not only potentially kills but also costs Endurance, so every die used for an action in a round costs a character one point Endurance. If a die is used to support another character, both loose 1 point Endurance for the effort. That's why regaining Endurance becomes an important option late in a fight. Another important aspect of this combat system is that dice can correspond with each other in the main actions. Doubles and triples have their added value per die, so a double 4 will result in both dice having a value of 8 each or a triple 6 (what one would call a critical hit) would mean an awesome result of 18 per die if all of them are used in main actions that round (and who wouldn't do that). This rule further emphasizes the importance of delaying dice to the next round and teamwork. It's regulated in that only doubles and triples are supported (if you use a quadruple of fours in your main actions they count as two doubles and so on) and that using lots of dice in one round (because of delay and teamwork) is very possible but also very exhausting (because of the Endurance rule described above). 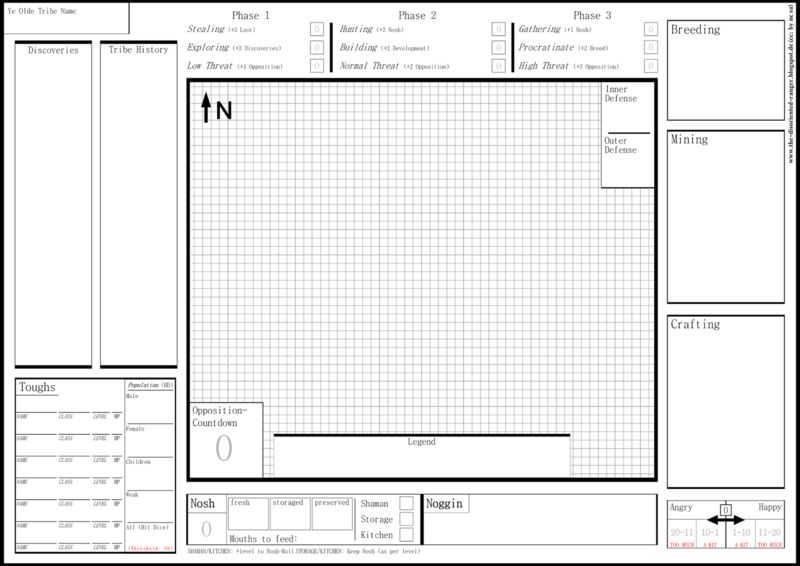 Level zero characters roll, as stated above, two dice per round. The result of those dice count for initiative. Experience and higher levels will allow for more dice. Play-testing suggested that this makes combat in the beginning rather dangerous and brutal, but that's intentional because it enforces teamwork even more. Strength in numbers and all that. A group aware of this will choose their battles wisely and will work together as much as possible. Characters have a base attack, a base defense, Health and Endurance to use in a combat and keep track of. Base attack (derived from Muscle) and base defense (derived from Finesse) are, depending on the quality-values chosen for Muscle and Finesse, +8, +10 or +12 respectively. Health has the quality Muscle as buffer, Endurance has the quality Grit as buffer. Both are determined randomly during character generation rolling two d6, using the low result for Health and the high result for Endurance (same method is used with every level advancement but may be modified). Using armor raises the base defense, specializing in a weapon raises the base attack. Shields are treated as weapons and make defense actions easier**. Since dealing damage is also a main action, a player needs to assign damage every time he assigns an attack. Health and Endurance each follow the same procedure, but come to different results in a combat. If the loss of Endurance exceeds it's value and the buffer, a character gets exhausted (effectively loosing one die) and if it gets beyond Exhaustion (zero or less, so to say), he's out of the fight, may collapse (roll d20 + Withstand (a Muscle based save) vs. 20) and may receive permanent damage to Muscle*. NPCs and Monsters would surrender when exhausted if a morale check fails. 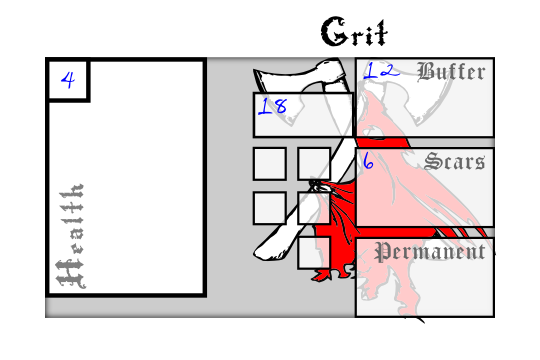 If the loss of Health exceeds it's value and the buffer, he gets seriously wounded (the kind of wounds that leave scars) and if he's wounded below that he will go down screaming, may even loose consciousness (roll d20 + Stomach (a Grit based save) vs. 20) and receives permanent damage to Grit*. NPCs and Monsters would flee when when seriously wounded if a morale check fails. Hugin and Snöri are in it for five rounds and it's getting serious. Hugin has managed to put some serious hurt on Snöri (who is seriously wounded), but it cost him most of his endurance. He is exhausted and has maybe one good hit in him to finish this battle. Not that this is going to be easy, since he lost 1 combat die for being as exhausted as he is. But he won't surrender and pushes forward. Snöri, on the other hand, is still fit enough to fight at full capacity (still being at least in the buffer zone), but knows he'll go down if he gets more damage. Fleeing is not an option and he sees his enemy's heavy breathing, so he also decides to see this through. Both roll their combat dice and luck is not in Hugin's favor. He rolls a 5 and a 3, while Snöri gets a 6, a 3 and another 3. But the 6 generates a new die and Snöri comes up with another 3 (rolled live while writing this ...). It's a triple! This should decide the fight right then and there. Hugin has lost initiative and has to declare actions first. He sees what's coming and knows he won't block it (he could manage a defense of (16 + 5 + 3) 24, but with Snöri having a triple there's no chance that it's going to be enough. He decides to reduce the damage he'll most likely get instead. For this he has to put one die into defense and one into damage (the value of the defense die doesn't add to his AC but indicates a defensive action, which is indicated by having a corresponding assigned as damage**). The choice is easy: the 3 goes on defense, the 5 on damage reduction. Snöri sees his enemy's weak attempt to stem himself against the attack. Still, he's all in. He can't have more dice assigned for damage than for attack, but having a triple 3 at hand (each die having a value of 9) he's able to put the 6 and one 3 into his attack to get over Hugin's AC easily, which leaves two dice with an awesome value of 18 for damage! Snöri will always be reminded of this battle because of the scars he got from it, though. So much for the example. And this is not the only way it could have gone down, even after all the combat dice had been rolled. Hugin could have decided to make the move and regain drop die actions, forcing Snöri to react and spend a die to counter one of those actions, ruining a full attack in the process (because with 3 dice left Snöri wouldn't have been able to put two on attack and damage and either the triple or the 6 are threatened by it, too). Or Snöri sees his enemy doing nothing and decides to delay one die and hurt Hugin just a little bit (a gamble, for sure, but possible). I believe there is lots of room for some creative fighting. It's no news for those following the blog, but the mini dice-games I posted earlier this year use a slightly different*** variant of the rules described above. For those interested to give this a spin, the rules and a "board" to play it on can be found here. Have fun! Without a proper solution for mass combat (as a skirmish, not as army vs. army****) it'd not only be a mess, it'd be unplayable as a role playing game. Initiative was the first problem I managed to get rid of. It's simply the Movement Rate of a monster in meters (a tenth of the original number, as it is in the German version of the Rules Cyclopedia). So a Blink Dog with a movement of 120' has a base movement of 12 m in the German version, for instance. And that's the difficulty players have to beat with their combat dice to be faster. If they roll less, the monsters are faster. Having a fixed initiative made the use of the dice more flexible for me as a DM. For the rest of the monster stats I only had to tweak the numbers a bit. HP deserve a kicker, since characters have something like that with the buffer. So monsters get a +6 to their initial value. Once they get wounded beyond that, a morale check is in order and they either fight on or flee. Base attack is 6 + hd. If there is a minus with the hd it gets subtracted from the base attack, so a Goblin (1 HD-1) would have a base attack of 6 (which isn't high, but they come in numbers and cooperate). Armor class is based on size and the value given in the monster entry. Take 20 for big, 22 for medium and 24 for small monsters subtract the listed AC and that's the armor class to work with in Lost Songs (Goblins, for instance, have AC 6 and are small, so the AC in Lost Songs would be 24 - 6 = 18). Number of attacks plus 1 is the number of combat dice a creature has and special attacks a monster might have will be treated as drop die actions. Now all is settled to fight big individual monsters, but masses will still be hard to handle. I used inkscape for this, open in a new window for more detail. I printed this in A3 and put in on the table for everyone to see. Those players involved in a combat got a number. Initiative is determined first and then worked from the lowest to the highest by assigning the number of attacking creatures per character, then rolling their combat dice. Distribution also happened according to initiative. So slow characters saw what's coming, but had to declare actions first and monster combat dice were distributed first for those faster. I started at the outer rings and amassed dice towards the center. Drop die action where collected on that circle on the lower right side, delayed dice in the middle. After the first round of combat I used dice to illustrate the values initiative, base attack and base ac so that players could plan their actions accordingly. Environment is the tricky part. The basic idea behind it is that while adventurers excel in fighting as a team, monsters will usually have a benefit from using their surroundings. So depending on how complex an environment is, I roll 2 to 4 d6 for the environment right before combat. A six in the initial roll also generates a new d6 to add to the fold and every one is discarded. The values on the dice stay that way for the entire encounter, they may be used by a creature if it's combat dice came up with a corresponding number. In that case the die with the corresponding number is used by that creature for that round (and only by that creature). It may not be used to generate doubles or triples***** and it will be available for other creatures to use in the next round. To indicate what is used and what not, I put the unused dice unto the outer set of squares and moved them towards the center when a creature was using it. An earlier version of this has been tested last Friday and it worked very well. There's lots of room to expand in and especially the idea to have a static value for the environment opens all kinds of possibilities for dungeons and ruins. But this is what I use right now for the basic combat system. All this is, of course, somewhat inspired by how board games work, but more to support the "theater of the mind" than the use of battle mats with miniatures and that's totally where I wanted to end up. I hope those of you reading this giant post in all it's glory could get an impression how combat will work in Lost Songs. It is, as of now, just the basics, but I'm expanding on those ideas on a regular basis, streamlining it whenever possible and I believe it will end up being an intensive experience for the players of Lost Songs. Combat was so far the most difficult thing to get done, but I'm very happy with how all the pieces fall into place. And I couldn't have done it without pestering lots of people about it. I feel there are some thanks in order, so I thought I'd get a bit emotional (you have been warned ...). For one there is that fantastic group of players (old friends and new ones) that keep coming back, give great feedback and seem to have fun finding out where this is headed. Thanks, guys! It's a pleasure to have you all along on the ride. But I also have to thank the community, as there is already a small group of readers following me down that rabbit hole with some anticipation and great comments. I can't say often enough that without the people listening I'd have no drive to go the places I've been with the blog. I really appreciate that. There's also the woman that gets to hear my unfiltered and crazy ideas on a day to day basis and still keeps hanging around and playing along. But her I'll thank personally. Well, enough of this for now. 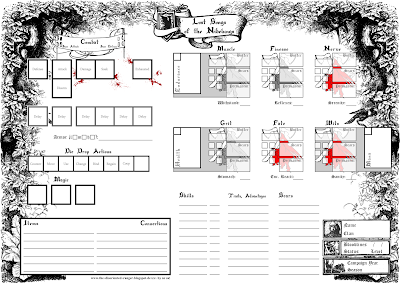 Next up (I hope tomorrow) will be a post about the qualities and task resolution in Lost Songs of the Nibelungs (with an updated character sheet, no less). Questions and comments are, as always, very welcome. 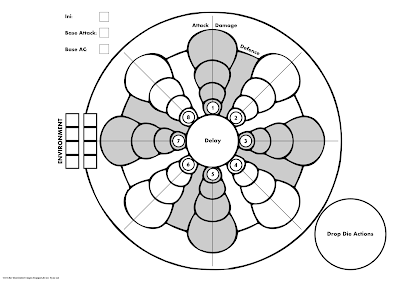 ** From the example above: using a shield would allow Hugin to just use a die (but only one die) for damage reduction. *** Additional rules introduced here are those for damage reduction and those for shields. In the version above characters also loose Endurance for every die they used in a round. You may either implement or ignore them. The final versions of those mini games will include the new rules, but it works either way. **** A system for something like that is far in the future, but I think it will have some of the same principles as those presented above, just with units instead of characters ... Need to think about it more, but what works above should work there, too. Part II about the basics of combat in LSotN can be found here and Part III about Qualities and task resolution can be found here. Fast and simple. Characters are Level 0 and have 6 Qualities: Muscle, Finesse, Grit, Wits, Nerve and Wyrd (Part 3 of this series will describe the qualities further, some ideas can be found here). Those are given fixed values. Players assign the values 18, 18, 16, 16, 14 and 14 to the Qualities to allow for some distinction between characters in the beginning (Qualities are shaped by what the characters experience, not by what's randomly generated in the beginning, my reasoning can be found here). Next step is to generate Health and Endurance. This is one roll of 2d6, the low result is for Health, the high result is for Endurance (it's also the basic procedure for every new level). The final step for character creation is rolling 3d6 for a characters bloodline. Every player rolls 3d6. The sum is a characters status in the group, with the lowest result being the highest in standing. Each rolled number represents now a facet of the society the character was born in (1 = royal bloodline; 2 = artisan bloodline; 3 = mercantile bloodline; 4 = artistic bloodline; 5 = foreign bloodline; 6 = magical/fairy bloodline). A triple 1 will mean true royal blood, so that member of the group will not only have the highest status and best equipment, he'll (she'll) also be a direct descendant of a clans leader (bonus advantage: privilege). A triple 2 will mean a true craftsman, so maybe it's a character who knows (or has access to) some valuable technique in a craft no one else in a clan is able to reproduce. He'll definitely have good equipment, special skills and an influential family (bonus advantage: versatility). A triple 3 will mean a true tradesman. Those are well informed characters with access to special items and rich parents (bonus advantage: information). A triple 4 will mean a true artist. Here it'll have a selection of exotic skills associated with artists (acrobatics, knife throwing, see below) and entertainment (bonus advantage: showmanship). A triple 5 will mean a true foreigner. This is the lineage of a very different culture, maybe son of an African slave who found his freedom with the fall of Rome and settled among the people of a Germanic tribe or the daughter of an Asian traveler (bonus advantage: diversity). A triple 6 will mean a true fay. This character is a direct descendant of the fay folk and basically a fay himself. Might be a dwarf or even an elf, but most likely something that at least to some extent resembles a human being and has a reason to tag along (bonus advantage: superstition). 1 die in a bloodline means 2 points to buy skills/advantages/items, two dice in a bloodline mean 5 points to buy stuff (one of them related to the dominant bloodline, so it would be an item with a trade related bloodline, etc. ), three dice means 9 points (with three to be distributed among skills/items/advantages associated with the true bloodline). Additional points are generated with family tie to other characters in a group. Every two dice that are connected this way generate one more point and now character may have more than two family connections to other members in the group (with a double meaning they are distant cousins, a triple meaning they are close cousins and a quadruple meaning they are siblings, five dice would be twins and six dice (as rare as they are) could mean identical twins, even, if players want to go that way). First Example: Let's assume three players generate characters this way and come up with (A) 1,1,4; (B) 2,4,6 and (C) 1,5,6 for their lineage. First character has a strong noble bloodline with some artistic aspect to it (resulting in 7 points to buy beginning skills/items/advantages so far). The second character has a mix of artisan, artistic and fairy-blood in his heritage (resulting in 6 points so far) and the third character noble, foreign and fairy aspects in his lineage (also 6 points). The players are now to discuss how they are related. (A) and (B) are connected with a four, so they are distant cousins (each getting getting one additional point to distribute). (A) and (C) are connected with three 1s, so they are cousins (each getting one more point to distribute). (B) and (C) are connected through their fairy lineage. Again distant cousins (again one more point to distribute for each). So (A) has 9 points all together to distribute, while (B) and (C) end up having 8 points each. They also all have family ties connecting them as a reason to go on adventures together and a clear hierarchy to work with (as (A) clearly has the highest status in the group, which at least is important for future social interactions, but could also inform group dynamics). Warriors and leaders come from this bloodline. Skills, advantages and items should reflect this. Craftsmen of a tribe. Skills, advantages and items should reflect this. The merchant bloodline, well connected and easy access to items. Skills, advantages and items should reflect this. Travelling folks and artists. Skills, advantages and items should reflect this. This bloodline connects a character to a foreign land like China or Africa. Skills, advantages and items should reflect this. In this case it means that while characters might have a similar skill set, advantage or item as other characters, but choosing it from this category will mean that they have different methods to achieve results and items look different. Customize according to culture used. Those will blood ties to the realm of magic. Skills, advantages and items should reflect this. The points a player gets from a bloodline can only be spent for buying stuff from that bloodline. As soon as this is done, the clan a group comes from and names for the characters need to be chosen and the characters are ready for their first adventure! Second Example: Character (A) from the first example above has 9 points to spend, 5 points for his noble heritage and 3 for his artistic heritage. 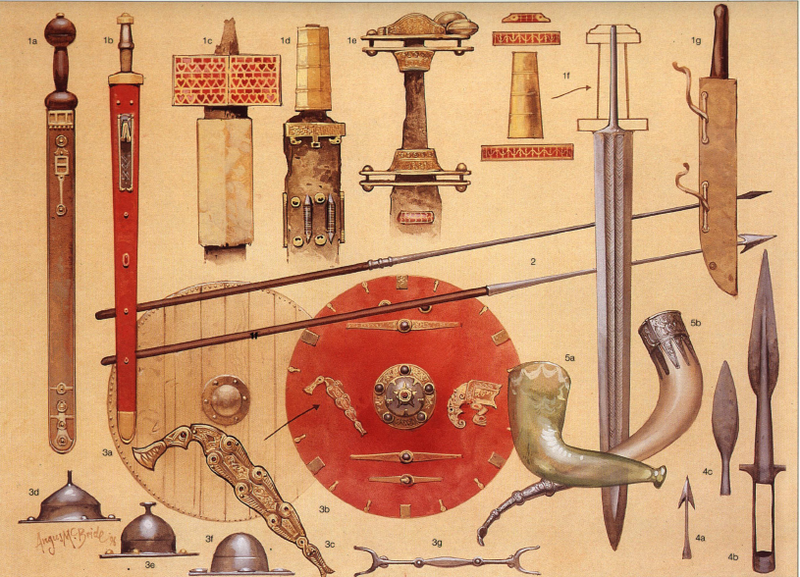 From the noble bloodline he chooses the advantage "Fighting with sword and shield", the items "Sword, Shield, Spear and dagger" and the skill "Intimidation" (for 1 point). From the artistic bloodline he chooses the advantage "Using light armor", as item "A set of light armor" and the skill "Entertaining" (for 1 point), because he has a funny bone. Third Example: Character (B) has 8 points to spend, 2 for the artisan bloodline and 3 for his artistic and fairy bloodlines each. He learns to use the bow and owns one, two (from the artisan bloodline), takes the use of light armor, owns one and learns hunting (artistic bloodline) and he chooses to have a fairy servant (from the fairy bloodline). Fourth Example: Character (C) has 8 points to spend, 3 for his noble bloodline, 2 for his exotic bloodline and 3 for his fairy bloodline. 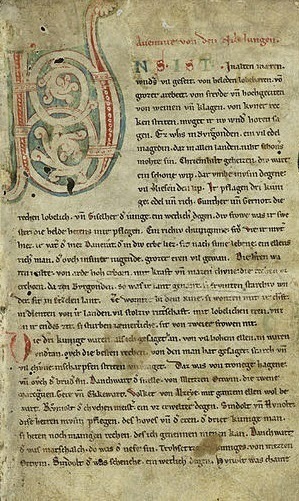 He takes "Reading, writing and speaking Latin" (1 point), "The art of rhetoric" (1 point) and a "Classic education" (1 point) from his noble background, "Charm" and "Stealth" (for 1 point each) from his exotic bloodline and he learned to use a dagger, owns one and has the light magical ability to know what a person is feeling when he is talking to them (for 1 point, because of this the character's eye color changes every day). His ancestors were African slaves under the Roman Empire, freed after the fall. So with just two rolls of the dice and a few decisions we got a singing warrior of noble heritage, a hunter with a pixie friend and a charming and sneaky scholar with an unusually dark complexion and a strange dagger as heirloom. A few words on this. The family of the character with the highest status is privileged to give a troop of adventurers their basic starting equipment. This is just an outline so far, but it should work as guidelines what is possible. 3 would be the highest possible status and a group will be very well equipped with expensive and richly ornamented travel garments, horses, some gold (3d6 x 10 gold pieces), tents, food for a week, basic camping equipment and they will be able to use the families name to get shelter and food from clansmen (all benefits from the bonus advantage "privilege" mentioned above). Everything below that will have some of those benefits to some degree, so if the highest status is connected to a merchant family, they might have more gold and all the equipment and they might have some connections to other merchant families for lodging. If the highest status is connected to traveling folks, they might have less gold and just solid travelling equipment, but should be welcome among other artists and entertainment is always welcome in taverns and with nobles. So each individual group will have individual means to get from a to b and get a roof over their head for the night or some food for empty bellies. Lost Songs isn't as much about material oriented resource management, but about how characters are formed by the adventures they experience. But I will have to address this at some point in detail, this just isn't the post I'm doing it in. After that I aim to tackle DM procedures for Lost Songs, like the random generation of a clans land for instance. Feedback about my very special snowflake here will be very welcome, of course. Since I'm right now up to my elbows in various projects here on the blog, I thought it's about time to give you all (and myself ...) a short summary of the state of affairs. I'll try and keep it fresh (or at least short). The idea to use a deck of cards to build a dungeon got quite some legs. +Eric Nieudan and +John Payne took the ball and came to some great solutions in this regard (check here and here). I love it when those things happen. It's all far better than anything I could come up with. Anyway, that's not what S!A!C! - Combat is about. Instead it's about cleaning random space stations from alien scum. And how far am I in finishing this baby? Well, I need to test it, that's how. The girlfriend and I are trying to make a test run happen, but no luck so far. We'll find the time this weekend, I'm sure. What I could do until now (it's what needs testing ...) is streamlining the combat as far as possible. So instead of having armor and health, you have just one stat and loose action points as soon as you drop below 10 (when wounded you get slower). I came up with an idea to make firing a gun a bit more than using a die and bookkeeping ammunition (I think it's a dull exercise to keep track of those things). What happens now is that each clip is a d6 and if you hit the target (roll d20 above card number, 11 is a true hit), you loose as much ammo as you rolled above the target number but never more than a d6 (this way you just change the die number or just take the clip from the sheet). If you miss, you roll the d6 to see what's left in your clip (keep the number you rolled and a 6 means the clip is emptied). We'll see if it holds in play-testing. Another little problem I have is with what I call "Card Intelligence" (C.I.). How should cards move and all that. Should they move towards the player or take cover and let them come?. Again, we'll be testing all this the next few days. We are still testing this in our Friday group and it's still developing further and further. Combat is getting somewhere but still not at a stage worth writing home about. Magic is a big gap and I need to do something about that soon, but level advancement is more important right now, as the players are already asking for it (not surprising, three sessions in). I think the most important development so far is how ability scores are handled. Everyone starts more or less the same and the narrative (fate) decides how characters are shaped. Organic character growth, if you will, mixed with a level-based advancement system that allows some freedom in how a character develops in that regard. Character creation takes 5 minutes and still creates unique snowflakes individuals. Reading the Nibelungenlied: Will take time. I might even switch to writing about each chapter in a separate post. The first post was received quite well, as far as I could tell. We'll see if I can keep people interested, but I think it's a great story with some beautiful verse and really very much like a session report of sorts. Bare-Knuckle Fighter/Pub Brawl (the mini dice-game series): A bit neglected on the blog, but I test this stuff as often as possible. What needs to be happening is a complete re-evaluation of how the rules are presented. I got some ideas and I talked a good friend of mine into writing a guest post. As soon as this happens (or I know for a fact that it doesn't ...) I'll start with the updates and give this stuff a permanent home somewhere on the blog. I plan to make similar mini games for magic combat and armed duels. All of this should in it's final stage work as a skirmisher and I still plan to use this combat system for lost songs. It will take time, though. The Lost Songs Page here on the blog: Needs updating. ASAP, as they say. There are already lots of strays to collect and put there. Also need to do some work on the logo. Ah well, it will happen soon enough. Lost Songs is a big project and will most likely expand in many more directions I didn't think of right now. Being a weekend blogger doesn't help with all that either. I need to have some food and shelter, though :) Anyway, I'm getting there, step by step. As of this writing I'm participating in two awesome community projects. Both were initiated by +Charles Akins over at Dyvers. 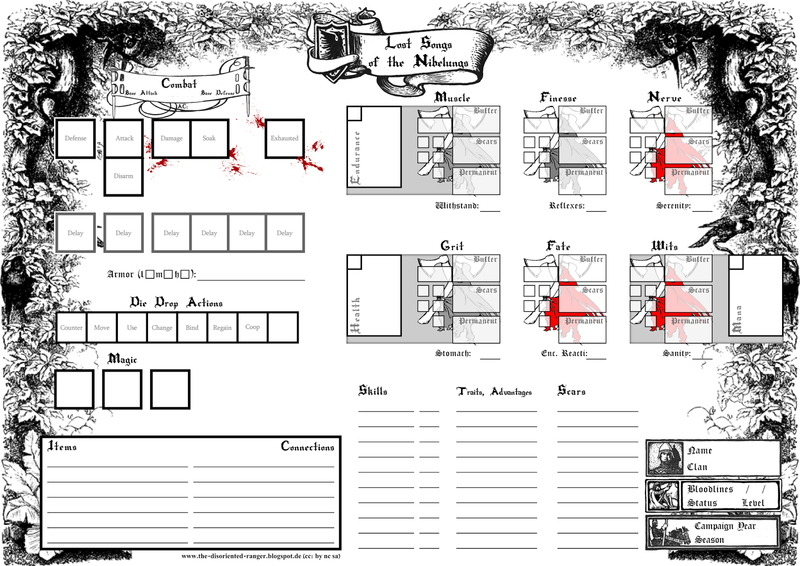 The first will be about revenge, murder and mayhem in role playing games. I aim for two entries in this: one will be my first attempt at short fiction here on the blog and the second is a surprise (as in: no idea ...). The second community project is about writing love letters for role playing games. I really love that idea, as it will collect a huge amount of essays about the games out there and what makes them special. It'll also get a pdf release and I imagine it a great help for introducing new people to the hobby. If we can spread it that far, which I really hope. But look at the line-up linked to above! It's 5 names short of a Who's Who in the OSR, so it's sure to generate some noise. 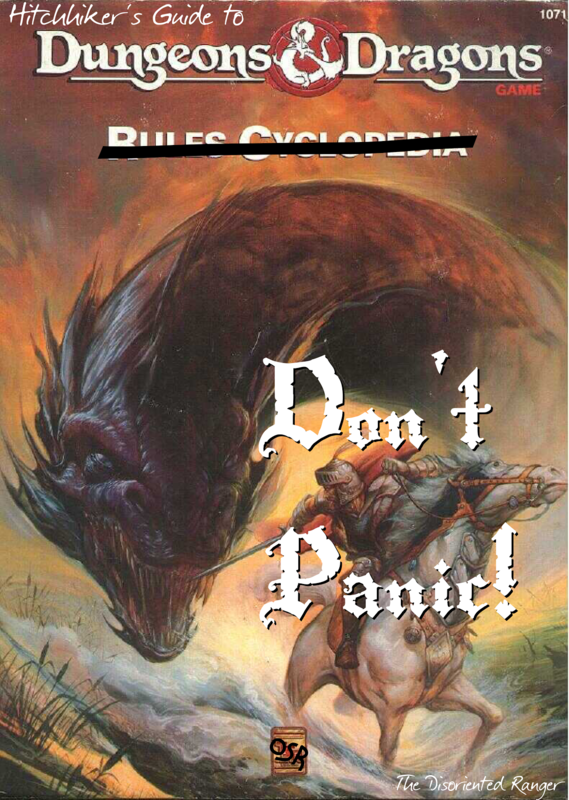 My entries will be the D&D Rules Cyclopedia and HackMaster 4e. Both are a big deal for me and I'll do my very best to do them justice. Smell what (else) the Ranger is cooking! Yeah, sorry, there is more. I'm going to take a close look at the blog and check it for loose ends. I need to come to a point where I actually finish the things I've started. Right now I'm thinking of one adventure and a series about clerics that need finishing/reactivating. I'll do this whenever I get the feeling I need some variation in what I'm writing about at the moment. I also want to start doing interviews around the blogosphere to learn more about the people I read so much on a daily basis. A first shot on this will happen soon, featuring the great +Adam Muszkiewicz, finding out who he is and where he's going (if you for some reason never heard of his fantastic blog Dispatches from Kickassistan, go and check it out - you're in for a treat). If it works, more of the same is going to happen on a monthly basis (I think). And there is a vague idea to write about great old school products out there that people already lost out of sight (like this great D&D supplement by Cygnus, for instance). But it's just that for now, a vague idea.